Vancouver, BC – Organizations lose an estimated 5 percent of their annual revenues to fraud, according to a 2012 study by the Association of Certified Fraud Examiners (ACFE). 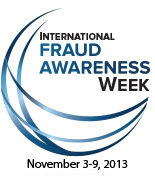 To help shine a spotlight on this global problem, WhistleBlower Security is participating in International Fraud Awareness Week, November 3-9, 2013, as an official supporter to promote anti-fraud awareness and prevention. During Fraud Week, international supporters will engage in various activities, including: hosting fraud awareness training for employees and/or the community, conducting employee surveys to assess levels of fraud awareness within their organization, posting articles on company websites and in newsletters, and teaming with local media to highlight the problem of fraud. WhistleBlower Security and Impact on Integrity will be hosting a webinar on Tuesday, November 5, 2013 at 9:00 a.m. PST focused on Fighting Fraud in Multinational Companies; Identifying Risks, Defining Your Communications and Building Strategies to Deter Fraud. To register, please visit http://info.whistleblowersecurity.com/webinar-fighting-fraud-in-multinational-companies/ or call 1-888-921-6875. WhistleBlower Security will also be attending the Top Employer Summit, November 13th-14th in Toronto, to showcase its hotline and case management tools that assist Canadian businesses to detect and deter fraud. To learn more, visit employersummit.ca. The 2012 Report to the Nations is available for download online at the ACFE’s website: ACFE.com/RTTN. The Report is in PDF format. WhistleBlower Security Inc. is a Canadian based global provider of customized ethics reporting services dedicated to safeguarding businesses against risk, and committed to promoting a culture of integrity, collaboration and transparency for our employees and clients. WhistleBlower’s 24/7/365 hotline reporting and analytic solutions are combined with advanced security and data management to equip organizations with the tangible tools that will deter and prevent ongoing fraud. For more information, visit whistleblowersecurity.com. Impact on Integrity is a European based and globally focused consulting firm, serving clients wishing to increase the effectiveness of their ethics and compliance, including anti-corruption and anti-fraud programmes. For more information, visit impactonintegrity.com. Founded in 1988, the ACFE is celebrating its 25th anniversary as the world’s largest anti-fraud organization and premier provider of anti-fraud training and education. Together with more than 65,000 members, the ACFE is reducing business fraud worldwide and inspiring public confidence in the integrity and objectivity within the profession. For more information, visit ACFE.com.